What cake event is complete without a brownie on offer? Well that’s what I thought anyway. So when it was time for my cake bake for the Book Swap event (some months ago now), it was just a question of what type of brownie to go for. I’d noticed a lot of peanut butter and chocolate combinations on the blogosphere and I’d not used this pairing since I made peanut butter blondies over a couple of years ago and before that peanut butter cupcakes. Both had worked well, so peanut butter brownies it was going to be. I based my recipe on one I had seen on the BBC ‘s Good Food site. Since then of course, I’ve also made caramelised banana and peanut butter cake and peanut butter cookies. Melted about 2/3 of a 340g jar of non sweetened peanut butter in a large pan over a low heat. Added a good glug of roasted peanut oil. Added 300g dark muscovado sugar and stirred. Added 150g dark chocolate (G&B 72% Cook’s Chocolate) and left to melt. Stirred it all together until well combined. Stirred in 100g wholemeal flour. Poured into a 9″ sq cake mould and leveled out. Melted a tbsp of peanut butter in a clean pan with a small glug of roasted peanut oil. Dribbled this over the top of the brownie mixture. Melted 40g of milk chocolate (G&B 37% Cook’s Chocolate) and using a spoon, drizzled this over the top of the cooked brownie in a random fashion. They were indeed very good and proved to be popular. Luckily, I managed to save one for CT and snaffle one for myself. This month’s random letter for Alpha Bakes happens to be P for Peanut Butter Brownies of course. Alpha Bakes is hosted this month by Caroline Makes and is co-hosted on alternate months by Ros of The More Than Occasional Baker. Thanks Laura. As long as your OK to eat peanuts and you like them, I’d say baking with peanut butter is a must try. Wow Choclette, these look absolutely delectable. As you know I have baked peanut butter blondies before, so very keen to give a dark chocolate version a go! Another of your lovely recipes is bookmarked here! What shall I say. I luv it. Would try it right away, if I had all the ingredients at home. Are you saying you have NO peanut butter or even worse NO chocolate Chris? Thanks Rachel. Good idea, will try that sometime. I have tried them with crunchy peanut butter which also gives a good crunchy texture. Having a good tidying up weekend. Just about to start cooking now as friends coming around for dinner. My favourite pairing ever is chocolate with peanut butter!! I’m not to be trusted around them. Seriously. Thanks Anna, they are very hard to resist! o my peanut butter and chocolate..that’s just heavenly! Angie, it’s such a hard combination to resist. they just look so good… we’ve just been to the Harrogate flower show and they had some wonderful ideas for brownies such as Terry’s Chocolate Orange and Malteser but none where a patch on these… gorgeous! Now why is it Kath, that as much as I love veg, heaven generally the word I associate with them, but brownies – you’ve got it in one. Peanut butter and chocolate is such a classic combination – these look absolutely delicious. I’m having a bit of a love affair with peanut butter and chocolate at the moment. Do you know I have never tried peanut butter and you really tempt me here. Wonderful looking brownies. Alida, that is astonishing. It’s such a common thing to put on toast over here, I guess it’s not in Italy? You’re right, it has loads of good stuff there, but I so rarely think to look. 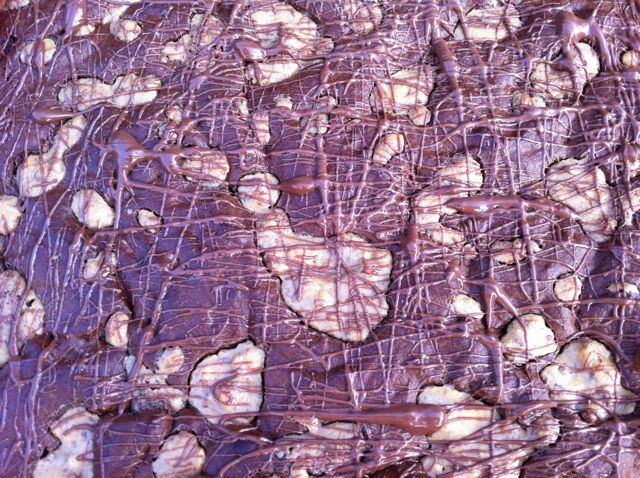 I love chocolate and peanuts together but haven’t tried brownies, yours look lovely. I’m loving the ingredients in these brownies. The use of duck eggs in particular sounds like it would make it extra rich and luxurious! I try to bake with duck eggs when I can get them. They are quite seasonal though and I’ve been unable to get them for a few weeks now. Thanks Kit, PB seems to be a very popular ingredient. Peanut butter in brownies sounds heavenly – I don’t know why I have never tried it before. Your finishing touch of drizzled chocolate has made these look beautiful! Thank you Hazel. Drizzled chocolate usually adds a touch of elegance, even on a good old fashioned brownie! Delicious – that’s a taste combination I’d never turn down. I love peanut butter in baking, but, for some reason, I can’t stand it on its own. I don’t think you are alone their Phil. It’s probably something to do with the oily quality which can make it seem too rich, but is absorbed when incorporated into baking? These PB wholemeal brownies look superb and heavenly. Yum! This is my first time visiting your blog and I’m now “lost” in your wonderful collection of baking recipes. I’m now following at your blog, Twitter and Pinterest. Thank you for your kind comment Zoe and thanks for following everything too. I usually make brownies with wholemeal flour as it’s lost in the dense chewiness and it makes me feel as though I’m getting some goodness out of a decadent treat. Thank you Miss F, I believe it’s a hard to beat combination. I love peanut butter – actually, I’m not that keen on it on toast but in baking and especially paired with chocolate it’s delicious! So I was very pleased to see this in the Alphabakes inbox! Peanut butter and chocolate is the best combination ever! Great combination- these would be amazing!